One of the most played games in our collection and this game started the really love for board gaming again. A fantastic cooperative game. We have definitely got our moneys worth. This game can be quite stressful and tense but it is so enjoyable. We have introduced this game to other friends and they have since gone out to buy their own copy. Highly recommend this game to anyone. This game is really really good. We only received it four days ago and haven't stopped playing it yet, so definitely getting our monies worth!!!!! 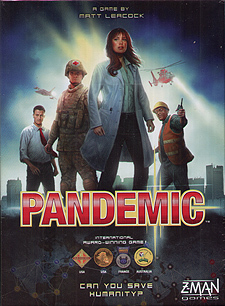 The game works because it is a simple concept of working together with your fellow players to create a cure for the four diseases or eradicate them if possible. We played this a few times on basic level and the game thrashed us!! The only problem with this game is that is addictive so you are constantly left with wanting that one more game!! A superb game. It takes a couple of rounds to get the hang of, but once you have got the hang of the basics it's a really enjoyable multiplayer experience. Not only do you have to work together but the game gives you a real sense of dread every time you have to turn a card over. The downside is that it is really addictive and you always want 'just one more game'. A great game that doesn't take too long to get the hang of. Nice to be working together with your comrades rather than against them for a change. A co-op game that gets the brain ticking over BIG time and on top of that is a fun and enjoyable game. Quick and with an addictive quality due to its replayability this will soon have you thinking and before you know it you\\\'ll be sat there all night. Games always get conversation going and this is no exception. I can\\\'t recommend this enough, you will certainly get your monies worth. Excellent packaging, artwork, easy to understand instruction packages, brilliant, brilliant game that will get you frustrated as well as exuberant. Got a few friends coming over? Want to play a game? This is the one. With a game time that is 40 minutes to an hour (depending on how long you take to make your decisions. All I can say is if you buy this you WILL be addicted to fun for the rest of your life. Thank you Spirit Games. I will be getting the Expansion Pack soon. You and up to 3 other players are battling to try and contain 4 deadly virus�s as they rage across the globe. Examples are moving to an adjacent city or if you are at a research centre you can move straight to another city with a research centre for 1 action. Remove a cube of virus from the city you are in. Build a research centre if you have the card for that city in your hand. Certain characters allow you to do more with these actions as a special ability, like the Medic can remove all cubes from a city for 1 action. On your turn you take your actions, you then draw 2 player cards and then draw infection cards acting on them by placing cubes on those cities. If a city already has 3 cubes of the same disease on it then you have an outbreak placing 1 cube of that disease on all adjacent connected cities, if they then get more than 3 cubes the infection spreads wider. This game is unpredictable the first game I played went really quickly as the 3 of us failed to control a major outbreak in Asia resulting in a swift completion of the outbreak track ending the game. The second game lasted a bit longer but again we failed to contain a major outbreak. As a team you are trying to control the outbreaks whilst attempting to develop the cures. To develop a cure you need to collect 5 cards of the same colour and then when you are at a research centre use an action to discard them thus developing the cure. Then once all the cubes of this disease are removed it prevents any further outbreaks and you can ignore infection cards for this disease. This game is just FUN. It is a co-operative game, and you do need to work together utilizing each team member�s strength to its best. We played two games of it the same night after the first ones quick finish and I�m sure I will be playing this one again. Each player has a role who ability bends the rules in a certain way. For example, the Medic role can clear all cubes at a city for an action instead Of one cube at a time like the other players. Gameplay is straightforward - take 4 actions to move or reduce city infection, find a cure or build a research station. Then you draw 2 cards for your hand and infection cards to see where the infections are spreading. If a city gets 3 cubes of one colour, then the infection spreads to neighbouring cities - if these then get three cubes, a chain reaction occurs and the infection spreads further. The object is to find the cures for the 4 plagues before game ends. This is done by having 5 cards of the same colour and being at a research station - easier said then done!